The Council of Ontario Directors of Education on its own and in partnership with the Ontario Ministry of Education is actively involved in a number of projects focused on specific educational initiatives that are of interest to our membership. The active projects are listed below. Each listing provides a short introduction and a link to the project. Research commissioned as part of the Technology and Learning Fund (TLF) for Dr. Jennifer Jenson to lead the strategic action research study titled Playing to Learn: Evaluating the Impact of Teacher Support for the Use of Videogames in Grade 7 and 8 Classrooms (Jenson, Hébert, Khayatt, 2016). The study’s teachers engaged their students in scaffolded inquiry spurred by a game-based learning environment called Sprite’s Quest, which includes two inquiry-based games that support the Grade 7 (‘Lost Feathers’) and Grade 8 (‘Seedling Saga’) Geography curricula. The apps provide students with the opportunity to explore different regions of the world and build geographical, literacy, and critical thinking skills. How does a professional learning workshop contribute to teachers’ ability to implement the game in the classroom? What challenges and barriers do teachers face in utilizing games in the classroom? What impact does using games such as Sprite’s Quest in the classroom have on student learning? The project was conducted in October 2015 to October 2016, across 24 schools representing 10 school districts. School district diversity included French, public, Catholic; with geographic representation distributed across urban, suburban, and rural areas. Sprite's Quest in the Classroom from Jen Jenson on Vimeo. assessment tools, discussion prompts, classroom learning activities, etc. Sprite's Quest: Student Perspectives from Jen Jenson on Vimeo. Offers student perspectives on Sprite’s Quest as a tool to support learning in physical and human geography. Sprite's Quest: Teachers' Perspectives from Jen Jenson on Vimeo. game-based learning, observations of student learning experiences, the value of the Teacher’s Guide. Sprite's Quest: Experience from Jen Jenson on Vimeo. Gives an overview of the Sprite’s Quest learning environment, and student perspectives of the game. teacher professional learning opportunities, researcher classroom visits. As part of the Technology and Learning Fund (TLF), Dr. Ron Owston of York University was commissioned to lead a strategic research study titled: Transforming Learning Everywhere: A study of the second year of implementation (Owston, Wideman, Thumlert, Malhotra, Smith, 2016). 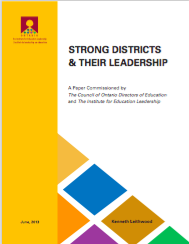 This study looks at Year 2 of the Hamilton-Wentworth District School Board (HWDSB)’s 5-year initiative,Transforming Learning Everywhere (TLE), to consider if, how, and to what extent the TLE’s implementation was effective in enacting TLE goals. The TLE aims to design and create innovative learning environments through a 2-pronged strategy that entails: (1) supporting educators’ pedagogical shifts toward collaborative inquiry-based approaches, and (2) a 1:1 iPad distribution program to all teachers and students by 2019. The study’s research questions are organized by their domains of action (i.e. school system level, teacher level, student level). What policies and TLE inputs have been put in place to implement and scale TLE, and to support professional development and a professional culture supportive of TLE aims and practices? How have these efforts been translated to the teacher and student domains? How have key TLE actors created or sustained change, and promoted a culture where actors at all levels of the board can begin to take ownership of the initiative and maintain momentum as TLE is scaled? To what extent have teachers embraced TLE and transformed their pedagogy, becoming facilitators of student learning, and in particular, how are they promoting deep learning through the adoption of inquiry-based teaching? The teacher level of analysis includes factors like formal and informal professional development, the impact of technology tools, and teacher dispositions and perspectives surrounding new inquiry-based pedagogies and iPad and technology use. What kinds of learning tasks were instantiated and what roles did 1:1 device use play in advancing TLE goals? What strategies were being used to assess student learning? What is the evidence for transformed learning environments, student engagement, and achievement in teacher and student interviews and student work samples? The All ‘I’s on Education: Imagination, Integration, Innovation project engaged 30 educators from 10 school districts (i.e. 1 school per district, 3 teachers per school), in arts-informed professional inquiry of collaborative cross-disciplinary teaching. Educators were introduced to “3i education” - a professional learning approach aiming to empower teachers “to be creative, collaborative, and courageous”, as they collaboratively conduct professional inquiry into the 3i’s: “imaginative, integrated, and innovative pedagogy”. The inquiry journey is a co-created process between researchers and teacher participants that unfolds over 3 stages - Planning, Implementing, and Reflecting; and is summarized by the research team in this graphic. 1. How might we as a group of teachers, researchers, administrators, and students come together to provoke imagination, integration, and innovation in teacher practice? 2. What conditions need to be in place for innovative practices to be imagined and implemented? Dr. Gould Lundy and her team have publicly shared all project materials on their project website: http://www.aioe.ca. These include: the 74-page final research report, the 68-page professional inquiry guide for 3i educators, video highlights from the live performance, audio recordings of teacher participants in the project, photos from the gallery of student work, and brief “school stories” of the innovation that occurred onsite at each school. Video highlights from a live performance where the teachers told stories about their own professional learning. On the evening of the performance, a gallery of student work was displayed. This study examined the use of robotics in 9 Ontario school districts. Through interviews, focus groups, classroom observations, and teacher surveys; the study explored the following: current practices of robotics integration to support elementary student learning, benefits of robotics, how robotics support 21st Century Competencies, challenges of integrating robotics in elementary curriculum, and practical strategies to support robotics teaching and learning. The CODE Consortium for System Leadership and Innovation (CCSLI) represents ten Ontario district school boards that, since 2005, have been involved in a province-wide initiative to improve the educational experiences of all students. The ten Consortium school boards were part of the CODE Special Education Leadership Project (2005-2008) that supported system leaders in improving learning for students with diverse learning needs including special education needs. During that time, a significant body of evidence was developed related to promising practices for special education programs and services that benefitted all students. 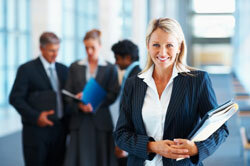 In addition, significant insights about program and system leadership began to emerge. From 2009 to 2012, the ten school boards funded, informed, and supported a research project that focused on the work of the CODE special education project. The research study was conducted by Andy Hargreaves and Henry Braun of Boston College. The final report of the study is entitled, Leading for All: A research report of the development, design, implementation and impact of Ontario's "Essential for Some, Good for All" initiative. The idea and strategy of "Leading from the Middle" emerged through the research study and the work of the boards and has been expressed conceptually and strategically in several papers and books on educational leadership. The Consortium held a symposium on November 2 , 2017, attended by close to 150 participants. A research report on the work of the Consortium and Leading From the Middle will be issued shortly. Go to the CCSLI Web Site to find out more. The Council of Ontario Directors of Education continues to partner and co-sponsor with the Ministry of Education implementation of Ontario's Technology and Learning Fund. Consistent with the ministry's renewed vision and core proprieties for education, the Technology and Learning Fund is directed towards increasing technology-enabled pedagogical practices focused on key 21st century competencies such as critical thinking, problem-solving collaboration, communication, creativity and entrepreneurship. To support sector-wide progress toward its renewed vision, the Ministry announced a commitment to invest in the $150M Technology and Learning Fund over three years. Go to the Technology and Learning Fund site to find out more. The Ministry of Education (EDU) introduced the Student Injury PreventionInitiative (SIPI) in January 2013. As noted in the Deputy Minister’s June 2016 memo, a “key initial objective of this initiative was to help establish and maintain a culture of safety mindedness in all school boards and schools as well as ensure that student injury prevention and safety is the highest of priorities for all. For Phase One, the CODE Health and Safety Team (with assistance from representative boards) developed a wide range of resources to support principals and supervisory officers in their efforts to ensure that student learning in science labs and technology shops occurs in a safe and healthy learning environment. In Phase Two, funds were provided to boards (based on a needs assessment completed by the boards) to facilitate all Ministry of Labour work orders being resolved and significant student safety issues addressed. Now in Phase Three CODE has a key role in facilitating Phase Three of the SIPI. This phase focuses on ensuring that student injury prevention is approached in a sustained, proactive and systematic way. This will include boards providing information through online surveys on current policies, procedures and structures that lead to a culture of safety mindedness and student injury prevention. Phase Three also includes the development of long-term school board student injury prevention plans. The timelines for Phase Three are September 2016 to June 2017. Developing a website with a comprehensive listing of resources that educators can use to build a culture of safety mindedness and student injury prevention. The Listening Stone Project Year Three Report now available, focuses on Starting Points,Turning Points and Learning Points. This report documents change over time and provides details on the work accomplished through the Fist Nations, Métis and Inuit – Focused Collaborative Inquiry 2015-2016. In addition to the Year One report (below) the First Nations, Métis and Inuit- Focused Collaborative Inquiry 2014-2015 report for year two is now complete. This report builds upon the year one research and highlights Deliberate Inquiry, Complex Questions and Deep Learning. The Council of Ontario Directors of Education (CODE) is pleased to post the Listening Stone Project report completed by Dr. Susan Dion, lead researcher for this project. Dr. Dion recently completed her study for CODE and the Literacy and Numeracy Secretariat. Dr. Dion's report certainly provides additional support for boards offering First Nations, Métis and Inuit focused CODE Summer Learning Programs. The Listening Stone Project was informed by the voices of First Nations, Métis and Inuit community members as well as Indigenous and Non-Indigenous educators who participated in this initiative. Started in the fall of 2013, the FNMI Focused Collaborative Inquiry Initiative (FNMICI) is intended to support success of First Nation, Métis and Inuit students. Fifteen District School Boards participated in this important Initiative. The pursuit of exemplary leadership practices and improving the learning for all students is the fundamental role of school district leaders. Beginning in the 2012/2013 School Years CODE commissioned Dr. Ken Leithwood to document the qualities and conditions of Strong School Districts. This was followed up with further work and study in Phase One (2015/2016) and Phase Two (Spring 2016 to present). Student well-being "lives" in the context of child and youth well-being and as such, school boards and public health units share in this important mandate. Strong partnerships that focus efforts on strategic priorities can improve health outcomes for children and students, positively affect their achievement and reduce preventable illness and injuries, which in turn will contribute to a healthier and better-educated citizenry. Working toward these shared mandates and common goals, in October 2013 the Council of Ontario Directors of Education (CODE) and the Council of Ontario Medical Officers of Health (COMOH) formed a provincial partnership committee. The purpose of the CODE/COMOH committee is to contribute to the well-being of Ontario's children and students through enhancing public health unit and school board partnerships in order to achieve optimal delivery of services and ongoing supports for children and students. sexual orientation, socio-economic status or other factors." Since the release of the provincial Equity and Inclusive Education (EIE) policy in 2009, Ontario school boards have established equity and inclusive education policies, and developed approaches to implementation of these policies based on their own internal organizational frameworks, processes and local contexts. To assist and support boards as they fully implement the principles of Equity and Inclusive Education. c) determining their own pathways towards full integration of equity and inclusive education into school and board improvement and multi-year strategic planning. Presented in the form of a rubric, Going Deeper establishes a set of policy outcomes. It is intended to assist and support boards in achieving the best academic and social outcomes among all students. This useful resource builds on the positive work that has been achieved to date in equity and inclusive education across Ontario's schools and boards. 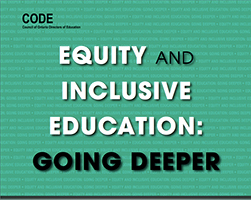 Further, Equity and Inclusive Education: Going Deeper provides an opportunity for boards to look to the future, and take those steps that will support continued implementation in order that all students can reach their full potential, regardless of background or personal circumstances. System leaders and trustees will find the rubric most helpful as they continue to fully integrate the principles and practices of Equity and Inclusive Education into all the work they do. The Council of Ontario Directors of Education with funding by the Ontario Ministry of Education have developed three Tool Kits and two Guide Books for parents. The resources provided will help families as they guide and support their children / teens throughout school and life. These resources are provided for your information and use and may be downloaded without infringing on copyright. As well as the downloadable Tool Kits and Guide Books, other resources, links, samples and messages that speak directly to Parent Involvement Groups, Parents and Educators are provided. Go to the Parent Engagement web page. Accédez à la page Web la participation des parents. Since 2010 the Council of Ontario Directors of Education continue to coordinate and provide leadership for a summer literacy and numeracy learning program funded by the Literacy and Numeracy Secretariat, Ontario Ministry of Education. This successful and worthwhile summer learning program is intended to support students in the primary grades who would benefit from engaging and interactive literacy and numeracy instruction during the summer months. 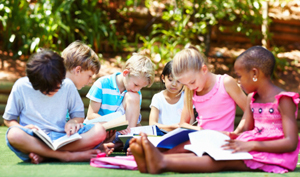 In conjunction with the summer learning program, there is a significant research study to examine the factors that minimize summer learning loss and close the achievement gap. Students are invited by school staff to the summer program and parents are actively involved. During the three years, reports have been published on the success of the summer learning program. As well, a program and planning guide has been developed to support boards as they implement summer programs. In addition, a number of resources have been developed by boards and are posted on this website. As part of the Ministry of Education's current Student Injury Prevention Initiative, the Council of Ontario Directors of Education (CODE) has organized a Health and Safety Committee with responsibility for identifying a common set of provincial health and safety promising practices, supporting the training of school board staff and the inspection of technological education facilities and science labs; and sharing Health and Safety resources for schools. CODE will also liaise with boards regarding the optimal use of expenditures for this initiative and the completion of board financial reports. 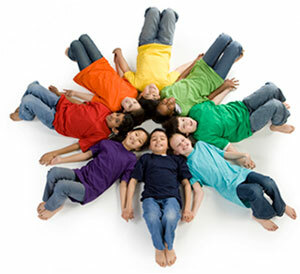 In 2009, the Ministry of Education released the document Realizing the Promise of Diversity: Ontario's Equity and Inclusive Education Strategy. The Strategy provides a framework to help the education community identify and remove discriminatory biases and systemic barriers to student achievement. The present document – a compendium of equity and inclusive education resources – is designed as a reference for educators who wish to expand their knowledge and understanding with a view to creating an equitable and inclusive education system and celebrating diversity and respect for everyone in our schools and society. The compendium will be a growing and changing document, intended to provide a broad representation of current resources including organizations and agencies, print and electronic resources, workshops and seminars. The CODE JK–Grade 1 Assessment and Intervention Project was funded by the Ontario Ministry of Education and started in September 2009. The goals of the project were to identify and implement effective evidence-informed assessment and intervention strategies for all students in JK–Grade 1; build teacher/school capacity; share strategies through leadership networks; and develop a monitoring tool to support boards in implementing effective JK–Grade 1 assessment and intervention strategies. 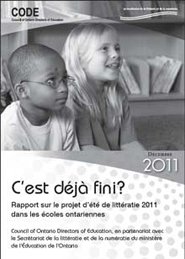 Ce projet d'évaluation et d'intervention maternelle – 1re année a vu le jour en septembre 2009. Il avait pour but de découvrir et de mettre en œuvre des stratégies d'évaluation et d'intervention fondées sur des données probantes pour tous les élèves de la maternelle à la première année, de renforcer les capacités du personnel enseignant et des écoles, de partager ces stratégies par le biais des réseaux de leaders et de créer un outil de monitorage en vue d'appuyer les conseils scolaires dans la mise en œuvre de stratégies d'évaluation et d'intervention efficaces auprès des élèves de la maternelle à la première année. 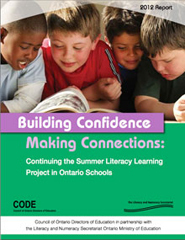 The 2012 report Building Confidence Making Connections: Continuing the Summer Literacy Learning Project in Ontario Schools provides an opportunity to learn more about the 2012 Summer Literacy Learning Project, with a special focus on new initiatives added this year. Do I Have to Go Home Already? 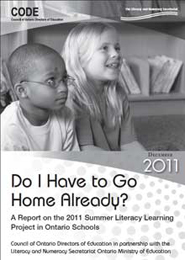 In 2010 and 2011, the Council of Ontario Directors of Education coordinated a Summer Literacy Learning Program and Research Project (SLLP) in district school boards throughout the Province. The summer literacy program with support and funding from the Literacy and Numeracy Secretariat, Ministry of Education was designed to help primary students to minimize summer learning loss and identify through a significant research component the variables and conditions which lead to successful summer literacy programs. The 2011 report on the summer program details best practices, parent and teacher comments and research findings. Durant l'une des visites in situ du programme d'été de littératie 2011, une enseignante nous a expliqué que l'une de ses grandes victoires était d'entendre des enfants dire à leurs parents « Je veux revenir demain » et « C'est déjà fini? ». Au moment de rédiger notre rapport, nous n'aurions pu trouver de meilleur titre que les paroles prononcées par un élève du programme. L'école d'été est synonyme de plaisir, de respect de soi, d'écoute de ses besoins, de confiance en soi et d'acquisition et de maintien de connaissances et de compétences. 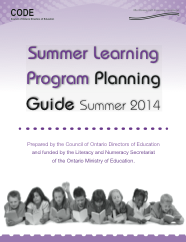 As a support and resource to summer learning CODE has developed a revised Summer Learning Program Planning Guide for district school boards as they implement CODE Literacy and Numeracy summer classes and participate in the accountability and evaluation components for the summer learning program. The Guide offers examples of community and parent partnerships, support for FNMI students, organization of classes, professional development activities for teachers, structures and timetables; and also details deliverables and expectations for summer learning programs. Afin de fournir un appui et une ressource aux programmes d'apprentissage pendant l'été, CODE a développé un Guide de planification des programmes d'apprentissage pendant l'été 2014, pour les conseils scolaires afin d'appuyer leur mise en œuvre des classes de littératie et de numératie et de participer aux composantes relatives à la responsabilisation et l'évaluation des programmes d'été. Le Guide offre des exemples de partenariats avec les parents, souligne l'importance de la participation des élèves et de la communauté, fournit des suggestions concernant le développement et la mise en œuvre des programmes. Le Guide comprend également les détails concernant les livrables et les attentes pour les programmes d'été et une liste de ressources pour le personnel enseignant et les parents.